The holidays are right around the corner and at Bloomex we are busy gearing up for another wonderful year! We are always looking for new and exciting gift options to offer our customers and this year we are proud to announce a new partnership with world-renowned chocolate maker Godiva Chocolatier. 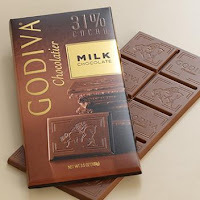 Founded in Belgium in 1926, Godiva began as a small praline-making business in a private home owned by the Draps family. Joseph Draps decided to expand into making chocolate and purchased a separate storefront in Brussels (where one of the original Godiva shops still stands today). The name Godiva was chosen based on the legend of Lady Godiva who rode naked through the streets of Coventy to help protest high taxes. Her courage was successful and Draps hoped that his chocolate would one day become just as legendary. And he proved to be right! In 1966 Godiva crossed to America and continued its expansion across the world. Bloomex is pleased to partner with such a renowned brand of truly delectable gourmet chocolate creations. Godiva chocolates are always a decadent treat, and the perfect way to send someone a remarkable gift this holiday season. 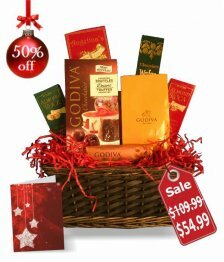 We've created four amazing gift baskets in a special Godiva Collection. Each one includes an array of special Godiva treats paired with other delicious nibbles so that you can impress even the most discerning recipient this year. Even better, the Godiva Collection is half priced for a special holiday introduction! Starting at just $54.99 these baskets are even more amazing. Don't miss out! 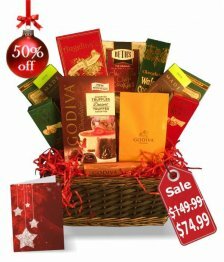 Order your special Godiva Collection basket with delivery across Canada. It's Christmas made easy! Visit Bloomex Canada to see the full array of wonderful gift baskets, for even more ideas this holiday season.